Hood Paint Company handles all types of residential and commercial paint jobs for interiors and exteriors. Our professional painters have years of knowledge and experience and guarantee that you’ll be pleased with the work they do. Call Hood Paint today for beautiful paint that you’ll enjoy for years to come. We serve Rock Hill, SC and surrounding areas, including Charlotte, NC. Hood Paint Company follows these six steps to guarantee the best interior paint jobs for our customers. Consultation with customer to select the perfect paint colors. Arrive on time when promised to begin the job. Move and cover all furniture. Repair imperfections in wall surfaces and prepare surface for painting. Paint surfaces using high quality brushes and rollers. Uncover furniture, clean room, vacuum, and return everything to its original position. After the job is done, we invite you to inspect all painted surfaces to make sure you are completely satisfied. We never ask for payment until the job is completed. Painting the exterior of your home is an investment that you want to last for many years. 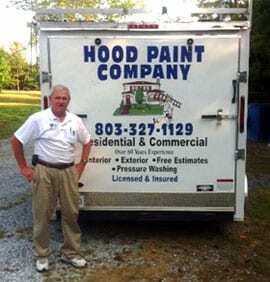 Hood Paint Company takes the following measures to make sure that you get the results you want. Wash with pressure washer to remove dirt and mildew. Scrape and sand any loose and flaking paint. Caulk and putty all cracks and holes. After these steps have been completed, we apply 100% acrylic paint or stain to all wood surfaces. In addition to painting houses, we also pressure wash and apply sealer, stain, or paint to decks, floors, rail, pickets, and other outdoor features.